2017 marks the 90th anniversary of the founding of the City of South Miami. First established near Cocoplum, the settlement developed in the late 1890s and early 1900s. With the arrival of Henry Flagler’s Florida East Coast Railway, the fledgling community moved west to US1 and Sunset – the foundation for the growth of South Miami was realized. Commerce. Economic Development. Growth. 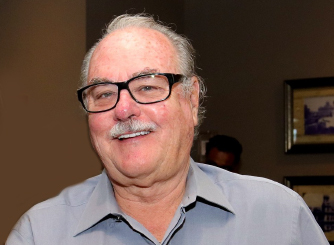 Over the course of many years, we saw the growth of what is today the City of South Miami. In this and the following five issues of SOMI Magazine, we’ll take you through the city’s progression over the years, and offer some commentary along the way. That’s looking back at the past ninety years… So where does South Miami go from here? What will South Miami look like when we celebrate our centenary ten years from now? South Miami is a unique community in a unique location. We must capitalize on what our founders realized. We must profit from our uniqueness with our T.O.D.D. (Transit Oriented Development District) and allow it to reach its potential. In the course of the next few years, we must address what is best for the US1 corridor by way of housing and business development. Commerce. Economic Development. Growth. These are the actions which brought us through the early days, and these are the words and actions which will ensure a sound future. In this issue, we also recognize another milestone in the 60th anniversary of Mack Cycle & Fitness, a USA Top 100 Bicycle Retailer (see page 23) and partner with community bicycling initiatives. And celebrating their 65th Anniversary this June is First National Bank of South Miami. 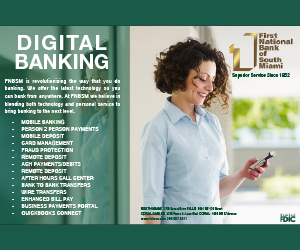 FNBSM was the first bank established in South Miami and has been our “hometown” bank for all these years. Congratulations to both community institutions! We also highlight new businesses in our area and appreciate their commitment and investment in our community. See our “What’s New in Town” feature on pages 40 & 41; this in the face of some store fronts being shuttered, which has had a visually negative impact in town. The national trend in retail downturn is especially concerning for the locally owned businesses. 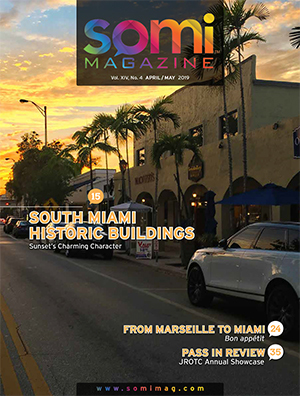 In this issue, read about the $625,000 beautification project on US1 completed by the Florida Department of Transportation. That project has really spruced up our curb appeal. The city is also undertaking more improved sidewalk cleaning and streetscape improvements. Those efforts are appreciated. That’s about it for now… Summer kicks off with the annual Twilight 5K Run/Walk, and make certain to head out for the big July 4th celebration at Palmer Park, which caps off the 90th Anniversary events being planned by the city. See page 16 for a listing of those events. And our readers have the last word in this issue. 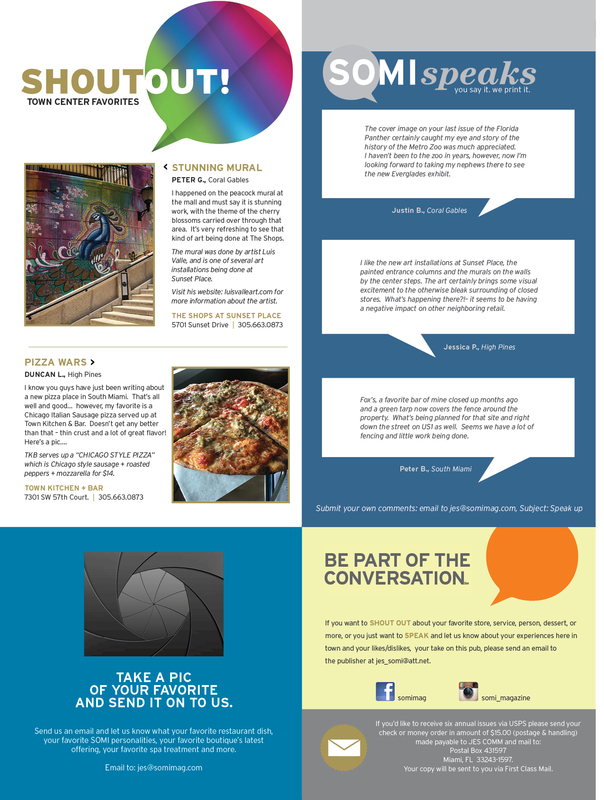 See our annual reader’s survey on the inside back cover – we saved a great place for your comments. Let’s hear from you. Thanks.